This piece ranks up there with Burges's best work; it is a stunning example of his style of painted Gothic furniture, but is actually by JS Chapel, Burges's assisistant of many years, who completed many works there on his death. 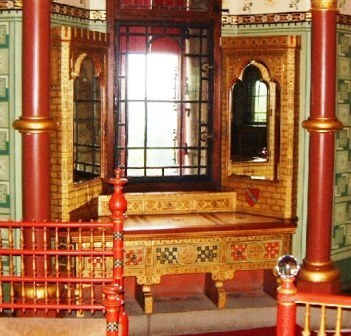 The sideboard or dressing table comes from Lady Bute's bedroom at Castell Coch, where it was fitted into a wall bay. It shows great imagination, being immediately Gothic yet a totally new piece, with little reference to past Gothic furniture. The dressing table or sideboard formed a complete unit with the 2 mirrors above, all built into a window bay. The whole bedroom is a tour de force of new Gothic forms & decoration, in a recreated C13th French style castle. For all of the ornateness of the piece, it exhibits the best in Burges furniture, great shapes with ornate decoration on mainly flat surfaces to create a striking new design. While many today would consider such a piece too ornate & 'busy', the fundamental shape is quite simple, almost like Arts & Crafts work (which Burges was a big influence on). Having studied this piece extensively we could make an exact reproduction of it (we have the scale drawings for it), or something close to this style but smaller. This look could be achieved in a square cornered room as well, the mirror units become corner units & achieve the same look. You could have any colour of stone, wood or painted worktop you want. It doesn't even need to be a washstand; you could use it as a drinks cabinet, sideboard, home cinema centre (with flat TV above in the middle) are some possible ideas. Needless to say pieces like this aren't cheap but you will always be adding a Wow factor to a room with it. 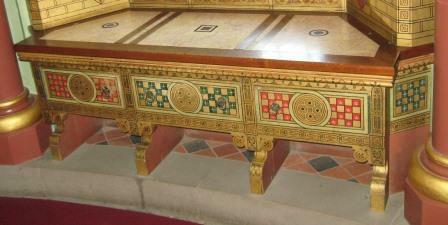 Shown above is the sideboard, for which we have the measurements. As a piece like this is made bespoke, you could have either an exact copy of the piece or change the size, colours, etc to whatever you want. The sideboard is quite low, to allow for the height of the mirrors above. However the sideboard height could be increased quite easily & till keep the same look. We will show some alternate colour versions of this below.